India's largest online Rummy platform RummyCircle.com, an initiative of Play Games24x7 Pvt. Ltd., is LIVE with the 10th Annual Diwali Rummy TournamentTM. The total prize pool is INR 4 Crores this year, making this Diwali Rummy Tournament the largest ever to be hosted by any platform in the industry. Furthermore, the First Prize of INR 1 Crore has Rummy players from all over the country competing to win the grand prize. The five-week long schedule of qualifier games began on October 7, 2018, with the Grand Finale on 11 November at 6 PM. This tournament is set to record the highest number of participants bringing the nation's best rummy players on one common platform. The 10th Annual Diwali Rummy TournamentTM (DRT) qualifiers consist of low, medium and high buy-in levels ranging from INR 100 to INR 10,000. A total of 1000 Finale Tickets to the Diwali Rummy TournamentTM will be given out. Players must participate in the Weekly Qualifiers to grab the Ticket to the Grand Finale. The qualifiers will run each day of the DRT from 7th October to 11th November 2018, giving players ample opportunities to reserve their seat for the Weekly Finale. Each Weekly Finale will give away 200 Tickets to the Grand Finale spread over the 5 Weeks. For further details on the schedule, Click Here. Talking about the Grand Diwali Rummy TournamentTM Play Games24x7, CMO, Sachin Uppal, shared, "We started this tradition of celebrating the festival of lights with the Diwali Rummy Tournament™ 10 years back, and we are really proud to see the massive growth in the participation whilst keeping the tradition alive. We want to thank our millions of Rummy players across India to make this the biggest Diwali Rummy tournament ever." The 1000 top rummy players from across the country will battle it out for the DRT Champion with the First Prize of INR 1 Crore. The prize pool of 4 Crores will be given out to the remaining winners with each player getting the guaranteed amount of Rs. 10,000. The 10th Diwali Rummy Tournament is the most anticipated championship of the year. The best of rummy players have started gearing up for the Grand Finale on 11th November at 6 PM. Ask any rummy player what their biggest dream is this year and you'll hear a lot of the same answer: Win the DRT. Play Games24x7, Co-CEO, and Co-founder, Bhavin Pandya, said, "Rummy has always been rooted in our culture and during Diwali, it is auspicious to play this game. Every year we host the Diwali Rummy TournamentTM and the response has been overwhelming year on year. DRT has not only proven to be popular but also the most anticipated tournament each year. This year our First Prize is going out for INR 1 Crore, which is the biggest in the industry till date. This tournament is every rummy player's dream and we are thrilled to offer our players an opportunity to win the Grand Finale. May the Best Player Win." If you are still thinking about joining the biggest Diwali Rummy TournamentTM, now would be a great time. Start playing the qualifier games and win cash rewards this Diwali. 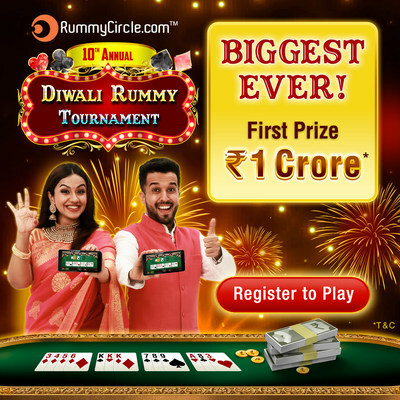 Just create your account with RummyCircle and join India's biggest Diwali Rummy TournamentTM. Backed by a strong technical support team, seamless payment gateways, and engaging user interface, Play Games24x7 launched RummyCircle on mobile and the desktop and has seen millions of registrations, clearly indicating the role that technology has played in transforming the experience of playing card games. In the past, the company has also seen investment from the Tiger Global Management, a leading hedge fund manager. Play Games24x7 launched Rummy on RummyCircle and Teen Patti, Rummy, Poker and Bet Cricket under Ultimate Games banner, and has recorded cumulative twenty-five million registrations and downloads for all the games put together. Source: Play Games24x7 Pvt. Ltd.